The C programming language is one of the most popular and widely used programming languages. It is a general-purpose programming language and there are very few computer systems in existence that are not set up for its use (i.e. where a C compiler does not exist). This course introduces you to the basics of programming in C. You will learn how programming languages work with data, what program flow is, and how to use functions, methods and routines. 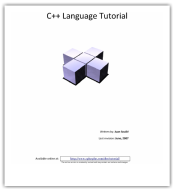 You will also get step-by-step instructions on how to create simple C programs and how to run them.